Volunteers in Mission (VIM) is a volunteer program with service sites worldwide. VIM is sponsored by the Bernardine Franciscan Sisters. Volunteers continue in the Sisters’ mission and commit to compassionate service, global justice, a simple life style and spiritual growth to work together to create a better world. I’m writing this on a Sunday, and as I lay resting after guiding a mission group through their spring break, I am awakened by an elderly man yelling out for Sister Valdair. Not only is it a Sunday, but also her only day off from tending for mission groups and running the pharmacy during the week. The man’s wife was ill and needed a medication. He didn’t have any money to get it at the nearest pharmacy. As I heard Sister Valdair walk through the house to the pharmacy, I was reminded that when caring for the sick and elderly, there isn’t a day off. This gospel reminds me of the realities of life, especially in third world countries where clinics and money are scarce. Just like Jesus, Sister Valdair has no limitations on when to treat or tend to those that need help. Entering into her sixteenth year at the mission, Sister Valdair, a Bernardine Franciscan nun, strives everyday to heed God’s calling in those she serves in the Tres Brazos community in Santo Domingo, Dominican Republic. 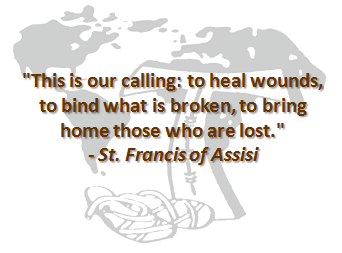 This is a driving inspiration for me and many volunteers that serve at the mission for the Bernardine Franciscan Sisters as we leave our homes to follow our missionary hearts. Cristina Paden is the program director for the Bernardine Franciscan Sisters, Volunteers in Mission program in Reading, PA.